The setlist for the E3 build starts with Twinkle, Twinkle Little Star and ends with the Mario Bros. Theme. You can play it on a wind instrument, string instrument bass, percussion, or guitar and never hit a bad note. It's less making music and more like playing jazz if that makes any sense. Players riff on the tune, and it's impossible to screw it up or play badly. The final number of instruments hasn't apparently been finalized — we were told it should be around 60 instruments. It will apparently include things like a sitar, beatboxing, bag pips and even dog barking! (Players select a dog costume for their Mii.) The final version will apparently offer customization. So, for example, you could cycle through the percussion instruments and select which one you wanted to play. That feature sounds like the game's most promising feature as the general noodling doesn't have the same I-feel-like-I'm-playing other music games have. And while typical music game peripherals actually are reminiscent of instruments, the Wii-mote waggle miming did make us feel somewhat removed from the music making experience — to the point where it was somewhat abstract, even. And the wind instruments—save for the flute—are held the same, no matter if it's a tuba, trumpet or bagpips. (The flute is apparently held like a flute.) It's like Rock Band but without the rockin' music or, you know, hard parts. 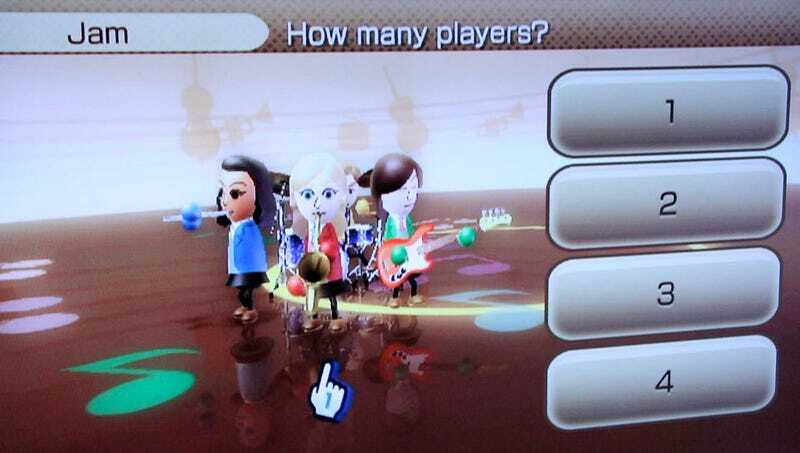 But Wii Music does definitely have the potential for customized four player synthesized music fun.